A couple of days ago we were treated to a sneak preview of the Nintendo Switch after one lucky gamer got his hands on the console early - and now an eagle-eyed viewer has spotted something rather interesting in the resulting clip. Hidden in the small print is a paragraph that says your gaming purchases will be tied to your online Nintendo account, rather than the device you're playing them on. Previously, Nintendo games had been locked to specific hardware, which meant a costly upgrade every time a new machine came out. "Your Nintendo Account contains your Nintendo eShop purchase history and current balance," reads the text. "By re-linking your Nintendo Account after initializing the console, it will be possible to redownload any software or DLC purchased using that account. (Software that has been discontinued may not be available to redownload in some cases.)" 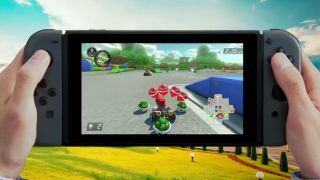 Good news for gamers then and another sign that Nintendo is finally getting to grips with gaming in the modern day - alongside all those games for mobile devices it's suddenly decided to start releasing. Nintendo itself hasn't made any comment on the revelation so we'll probably have to wait until the Switch finally goes on sale (March 3) for confirmation of exactly how this is going to work - will you be able to register multiple Switches with the same account, for example? Nevertheless it's a promising development though. Another unanswered question is whether or not compatible games from the Wii U and 3DS also be available to download through the new system, thus saving money on new copies... but we just have to wait and see. In the meantime here's everything we know about the Nintendo Switch so far.